The hubs and I are both really willing to jump in and work together on things, preferring to both do yard work, or home improvement projects, then jointly tackle the dishes or laundry later, maximizing the amount of time we get to spend with each other. To be honest, I much prefer mowing the lawn to doing laundry, and (weirdly I know) love to paint the house, or do home improvements. But with the birth of our offspring, it gets harder to do all of these things together. We still try to do the jobs as a family, but of course, a two-year old is going to lose interest, and one of us is relegated to playing/entertaining him while the other one finishes the task. All this to say, I am a pretty "hands-on" type of wife, and I have been so excited to get my hands on this little r.v. of ours. Okay, I haven't been so thrilled about cleaning out the tank (which scared me a bit, I must admit), but everything else has been a great learning process for me. There's something empowering about being able to take care of the things you have, and knowing how they work. Which brings us to this trip. A few months ago, a friend of R's, mentioned that they go camping with friends and family each year, and invited us to go with them. The trip was over a long weekend, as our children had a vacation day on Friday. My dear husband had to work (we had just returned from our Yosemite trip, and somebody's got to pay for the gas in this thing!) so we talked about it, and decided I would drive the r.v. up, and he would meet us at the campground Friday night after work. The week leading up to the trip was pretty much the norm; packing, making a menu, pre-cooking food, and laundry. Sadly, I learned that prepping for a long weekend trip, is not much easier than prepping for a week-long trip (just less food basically). No wonder we try to go on longer trips when possible. I put on a brave face, but truth be told, I was a little nervous about taking the Winnie out alone. Our kids can be a handful in the car, and I had already given them the speech about total driver concentration, and not being able to get up to get them things while I was driving. I was also a little nervous about being able to get into our camping spot, level the r.v., fill it with water and start the fridge all while keeping the kids contained and safe. But it was a perfect trip for me to gain some confidence and learn how to do all of this solo. The campground was only about an hour away, so a great "learning experience" for me. As fate would have it, I found a very cool blog called Winnie Views a few nights before my solo outing. Lynne (and her adorable dog Millie) cruise across America in their Winnebago View. 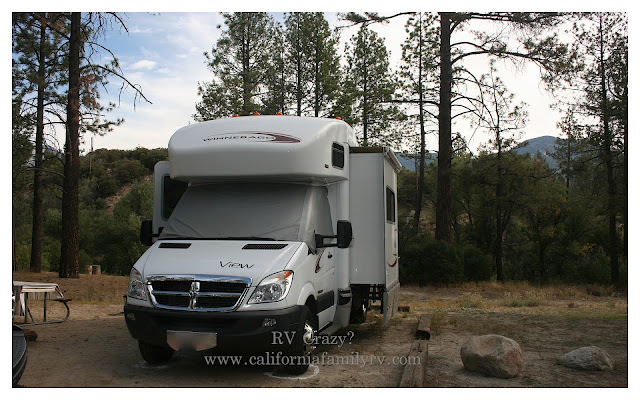 She has a very helpful page on her blog, A Girl's Guide to RVing, which is awesome!! 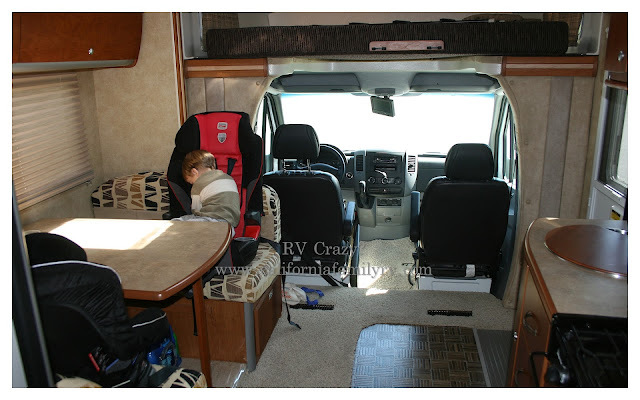 Quick tutorials with photos for filling the rv with water, emptying tanks and a multitude of other necessary tasks you'll need to do on the road. I love it! Now, I've walked through these tasks many times with my dear hubby, but there is something so reassuring about having them outlined, in print, with pictures, for someone like me. Thanks Lynne, I just love your blog! So, our take-off morning had arrived, and I'm not gonna lie to you here, the drive was a little intimidating. Not driving the Winnie, she is a breeze. She fits easily in the lane, is very maneuverable, and just really pleasant to drive. Having driven her on portions of our trips before, I felt really comfortable taking her out. However, the other drivers are scary. Seriously, they're scary! The road to Hurkey Creek Campground is windy and mostly one-lane with limited passing areas and paved pullouts. I was able to safely drive at or nearly at the speed limit for most of the trip. Each time there was a paved pullout, I used it and let cars behind me pass. However, that didn't stop cars from tailgating, and even dangerously speeding around me in no-passing zones. After just a few minutes on the road, I began to have sweaty palms and a tight knot in my stomach. I pulled over at the next safe spot, and took several deep breaths. I realized that the only safe way to finish this trip was to just forget about the impatient drivers behind me, and focus on my drive. When I pulled back out on the road, I was much more confident, and focused. I drove safely, and at a very reasonable speed, and I continued to just pull over on the safety pull-outs whenever they were available. It was a bit amusing to me that little sports cars would zoom past me (God forbid they get stuck behind an rv for crying out loud) only to realize that 70 was a little fast to be trying to take the curves on this road. I ended up being right behind them, but no matter to me! I'd rather let them try to break their necks and have my kids safe inside our vehicle. It's not a race after all. There was only one more VERY scary moment on our journey. At a particularly curvy section of the road, four cars were lined up very closely in the oncoming traffic lane. The last car, impatient to pass, pulled way out into my lane (despite double yellow lines in the no-passing zone). He was right in front of me, and there was nowhere for me to go. I inched to the right as far as I could go (no emergency lane, and the road was just a drop-off) and hit the breaks, and the horn simultaneously. The car swerved back into its own lane at the last second, and I could breathe again. Whew. Very, very scary, but thankfully we were completely fine. I just don't understand why people are willing to risk the lives of their entire family just to shave a few minutes off their drive. It's insanity to me. 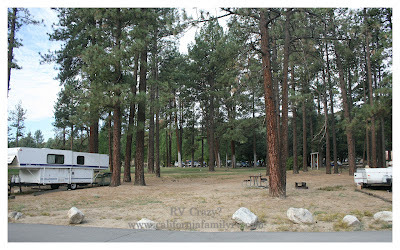 But anyway, we arrived at the campground, and checked in. The campground hosts were great, and very friendly. Fortunately for me, our spot was easy as pie to pull into. I just backed in like a pro (ha ha, fooled them, I'm a rookie!!) and went to check the level. By some miracle, it was so close to being exactly level, I didn't even think it was worth pulling out the levelers. I put out the tip-out, and bada bing, it became perfectly level. Woo-hoo!! I did it!! The only difficulty at all, was the fact that my kids wanted to all get out and run around with their friends. I couldn't exactly let my 2, 4 and 7 year old free to roam the campground with friends I didn't know very well. So I curbed the desire to get the campsite all perfectly set up, and decided to get out and run with the kids for a while. Set-up would have to wait. 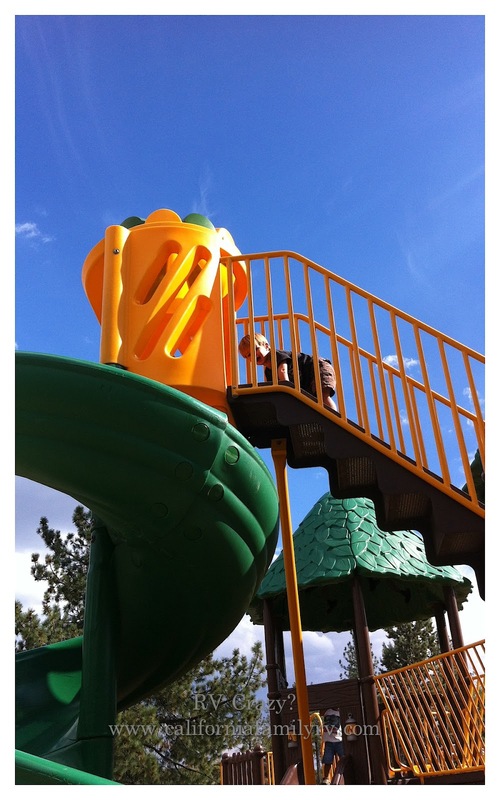 Hurkey Creek has a play structure for the kids to enjoy. Of course my littlest one had to climb to the highest point immediately. Hurkey Creek is much more like a park setting than a rural campground, but it was absolutely perfect for the kids, and for a group camping trip. There are large expanses of grass, with pine and mesquite trees surrounding them. We had chosen a creek-side site (which I though would be more scenic and private), but the park-side sites would probably have been better suited for the small kids. Our creek-side campsite (see, I told you it was an easy site to get in to!) There were tons of ants, which is why there's powder around each tire. I did not want those little buggers in our r.v. 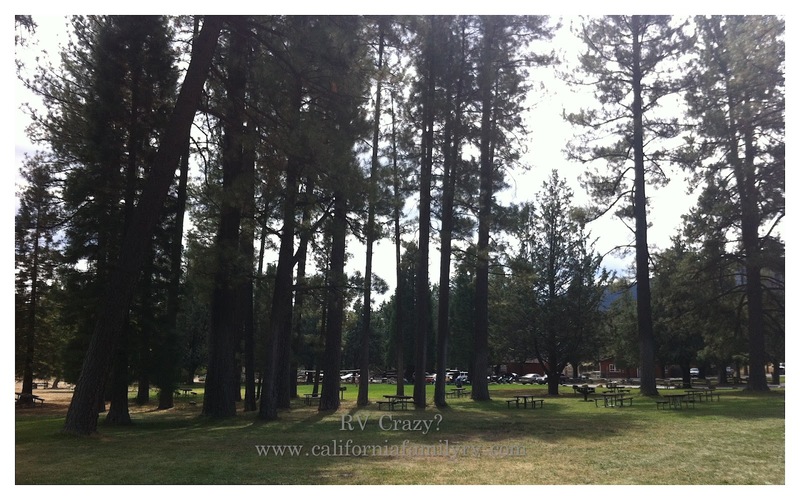 Lots of tall, pretty trees, and plenty of grass for the kids to run around in. 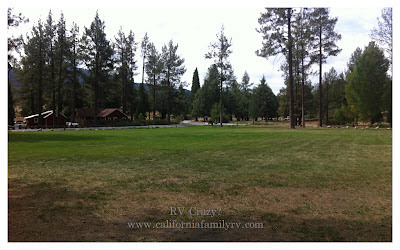 Just to show you some of the campsites on the park side. Hurkey Creek was great for a weekend getaway. 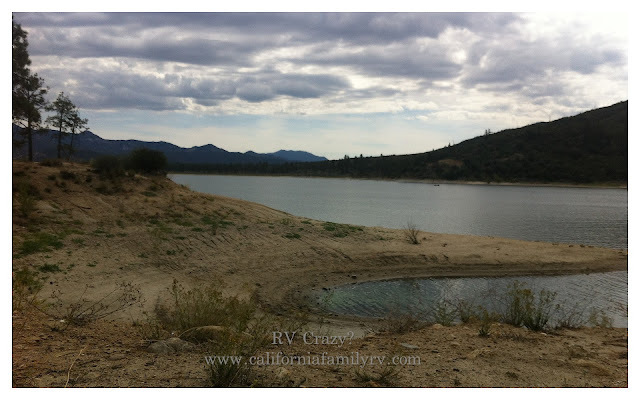 There is a lake nearby (Lake Hemet) which we rode our bikes to. It's a pretty easy ride, although you will have to cross the highway to get there. Honestly, the campground was not my favorite type. I really like to be away from it all in the woods, or near the beach, but it was simply perfect for our intended use this weekend. The kids had a fantastic time with their friends...lots of soccer and frisbee games, and plenty of s'more roasting. And the parents were easily able to visit, while the kids safely played within easy view in the fields. And most importantly, I got my first solo drive under my belt. There were people fishing and boating at the lake, but we simply rode around it and enjoyed the scenery. I know it sounds cheesy, but there really is something very empowering about being able to drive the rv, set it up, and camp with your kids. As I've said before, my husband is awesome, and we are a great team. But it is all too easy to fall into the predictable routines of me watching the kids, and him handling all of the rv stuff. That really does work well and very efficiently, and honestly, we probably will do that most of the time when we're together (while the kids are so young), but I am so happy that I stepped out of my comfort zone and tried to do this by myself. Even though I've watched him drive, and set up, and load all of the bikes, and unload all of the bikes, and empty the tanks...and all of the other million rv duties he's done in the past, doing it myself gave me even more of an appreciation for all of his hard work. At the same time, being able to handle doing all of these tasks by myself, really made me more secure in the fact that I can do this too! 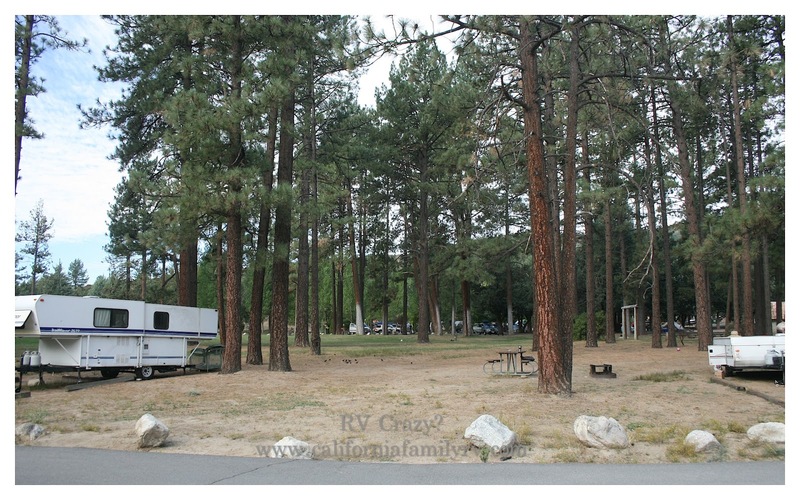 When he arrived to the campground Friday evening to a perfectly leveled rv (shhhh...we won't tell him that was just luck) a well-organized camp-site, dinner cooking, our kids playing happily, he took it all in stride. After all, he had been confident I could handle it all. So he looked at me a little weirdly when I yelled, "TOWANDA!!!! I did it!!!" (You'll have to go see Fried Green Tomatoes if you don't get the reference). Now I really can't wait for the next trip!